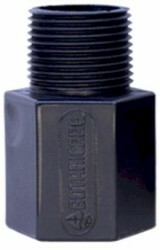 Botanicare Ebb & Flow fill/drain fitting 1/2"
Fill/Drain fitting only, no screen or extension. 1/2 inch tube outlet. 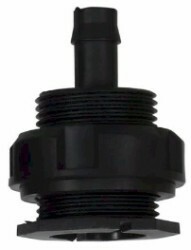 Botanicare Ebb & Flow fill/drain fitting 3/4"
Fill/Drain fitting only, no screen or extension. 3/4 inch tube outlet. Requires 1-3/8 inch holes. Extension fitting only, no screen or fill/drain fitting. 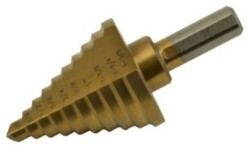 3/4 inch NPT. 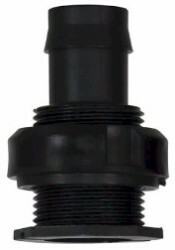 Botanicare Ebb & Flow fill/drain fitting 1"
Fill/Drain fitting only, no screen or extension. 1 inch tube outlet. Requires 1-3/8 inch holes. 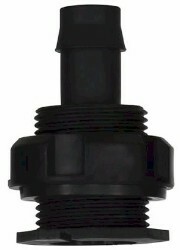 Kit includes: 1 - 1/2" Tub Outlet Fitting, 1 - 3/4" Tub Outlet Fitting, 2 - Screen Fittings and 3 - Outlet Extension Fittings. Manufactured using the finest quality materials and craftsmanship. Requires 1-5/16" hole. Manufactured using the finest quality materials. Requires 1-5/16" hole. Replacement tube set for the Multi Flow System. Includes fill/drain tube mount with integrated siphon breaks, fill tubes, drain tube and tubing wrap to protect the tubes from kinking. Replacement fill/drain tube mount for the Multi Flow System. Integrated siphon breaks. For 1/2" ID tubing. Rubber stopper. Fits in the end of the 3/4" connector. Used in the Multi Flow system. 17mm at the top, 13mm at the bottom, 25mm tall.